During this reporting period, elections were held in four countries, namely: Djibouti, Chad, Equatorial Guinea and the Comoros. President Ismaïl Omar Guelleh of Djibouti and President Idriss Déby of Chad contested for their fourth terms while President Obiang Nguema of Equatorial Guinea contested for his fifth term. Election in Comoros however necessitated a rerun. Within this context however, the EPP department coordinated EISA's support to the African Union (AU) through in-country support to AUEOMs and training of AU long term observers (LTOs). The department also coordinated EISA's support to Regional Economic Communities (RECs), specifically, the East Africa Community (EAC) through technical support to its post-EOM review event for the Uganda and Zanzibar elections and the Economic Community of West African States (ECOWAS) where EISA is currently in the process of signing a Memorandum of Understanding (MoU). The department has also been involved in the planning of EISA's 20th anniversary celebrations and hosting the annual implementation meeting of the Declaration of Principles (DOP) for International Election Observation which will take place during the week of the Symposium. The EPP department continued to contribute to EISA's institutional goal of promoting credible elections on the African continent providing technical assistance to partners such as the African Union and the East African Community (EAC) and commencing the implementation of the Electoral Integrity in Africa Project. In the course of the year, the Department provided support to electoral processes in five countries namely: Sudan, Togo, Benin, Ethiopia and Burundi. These countries presented unique challenges such as the limitation of the presidential term as seen in Togo, Benin and Burundi and secondly, the conduct of elections in light of constrained rights and freedoms as seen in Ethiopia and Sudan. EISA's leadership in this field was recognised and acknowledged by the African Union as it renewed its Memorandum of Understanding (MoU) with EISA for another five year period in June 2014. The department also continued to strengthen its partnerships with regional economic bodies such as the East African Community (EAC), The Economic Community of Central African States (ECCAS) and the Southern Africa Development Community (SADC). In the period under review12 elections were held on the African continent in the following countries: Algeria, Botswana, Egypt, Guinea Bissau, Malawi, Mauritania, Mauritius, Mozambique, Namibia, Sao Tome and Principe, South Africa and Tunisia. The elections in Egypt, Guinea Bissau and Tunisia were transition elections that were critical for democratic development on the continent. 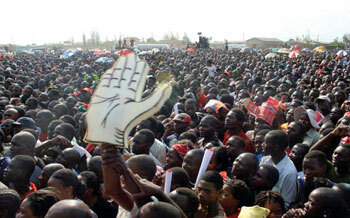 The elections in Malawi and Mozambique were regarded as crucial given the nature of competition both elections presented. In Mozambique, the elections took place within the context of political negotiations and armed conflict. In Malawi, Africa's second female Head of State contested and lost the elections. During the count the incumbent contested the outcome which were upheld by the Judiciary and the Malawi Electoral Commission which had confirmed the outcome. The EPP Department coordinated EISA's involvement in these elections through the deployment of pre-election assessment missions to all these countries except Algeria and Mauritania. The department also coordinated the deployment of EISA Election Observation Missions (EOMs) to the presidential, legislative and provincial elections in Mozambique and the constitutional referendum in Egypt. The department coordinated the deployment of EISA technical support teams in different capacities as trainers and support staff to EOMs deployed by the AU, EAC and SADC. The department also continued to contribute to knowledge production in the area of elections through the ACE Electoral Knowledge Network. The year 2013 saw fifteen elections that were conducted on the continent. The elections in Mali, Kenya, Zimbabwe and Madagascar were all significant elections. In Madagascar, the elections generated an end to a lengthy transition process and the reinstatement of Madagascar's membership in the African Union. In Mali the elections were aimed at ending the political crisis that resulted from the civil war in the North of the country and the subsequent military coup. The elections in Kenya and Zimbabwe were post-conflict elections and followed years of government reconstruction and national unity. 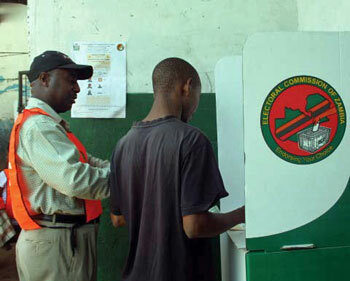 EISA was involved in all these elections providing technical support to the African Union and in some of the elections. The Institute provided technical support to Regional Economic Communities (RECs) such as the East African Community (EAC), the Southern African Development Community (SADC) and the Common Market for East and Southern Africa (COMESA). EISA's partnerships with the EAC and COMESA were formalized in a memorandum of understanding. As part of its election assessment and documentation initiatives, EISA deployed six pre-election assessment missions to selected countries as well as deploying expert teams to assess the critical elections in Kenya and Mali. A fully-fledged EISA observer mission was deployed to the elections in Madagascar. In response to the requests for increased support made to EISA by the Democracy and Electoral Assistance Unit (DEAU) of the African Union Commission, the EPP department co-ordinated EISA's technical support to all African Union Election Observer Missions during the year. This privileged role contributed to strengthening EISA's place as a key player in the field of elections on the African continent. The Elections and Political Processes (EPP) department continued to expand Continental wide as the political space opened up in North Africa following the "Arab Spring" that begun in Tunisia in 2010 and reverberated around the rest of the Arab world. The department was involved in electoral processes in the North African region through the deployment of long- and short term witnessing missions to the People's Assembly and Shura Council elections held in Egypt during this reporting period. The deployment of these missions also enabled EISA to include participation of Tunisian and Libyan observers, creating peer learning opportunities for the inexperienced observers. The department continued to strengthen its partnerships with the African Union (AU)/Pan African Parliament (PAP), East African Community (EAC) and South African Development Community (SADC) in the area of election observation. EPP also gave technical assistance to election stakeholders, namely civil society organisations (CSOs) and Electoral Management Bodies (EMBs) as well as promoting good governance within the corporate sectors, political parties, tertiary institutions, statutory bodies and CSOs through its Balloting and Elections Services unit. The department also continued to contribute to the ACE Electoral Knowledge Network as a partner in the Network. The Elections and Political Processes (EPP) department continued to expand and deepen EISA's coverage across the African continent, mainly through its partnership with the African Union (AU ), as well as regional economic communities. Landmarks for this expansion included the signing of Memoranda of Understanding between EISA and respectively the East African Community (EAC) and the Economic Community of Central African States (ECCAS). EISA also continued its support to SADC, particularly in the field of election observation. The department fulfilled its objectives through a number of programmes, with some of them cutting across other departments and EISA Field Offices.It provided assistance to EMBs, as well as promoted corporate governance within the corporate sector, political parties, tertiary institutions, statutory bodies and CSOs through the conduct of internal elections. The EPP department deployed several continental observation missions, including missions to the Central African Republic and Tanzania. 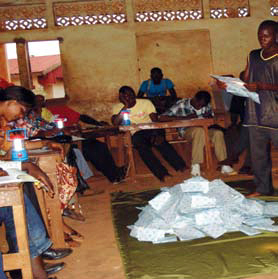 During 2009, the Elections and Political Processes department (EPP) continued deepening its traditional activities in the areas of election observation and assistance to election stakeholders, namely, pan-African institutions, CSOs and Electoral Management Bodies (EMBs) as well as promoting governance within the corporate sectors, statutory bodies and CSOs through the conduct of corporate elections. The department also continued expanding its continental coverage mainly through organising continental election observer missions and working with pan-African organisations such as the African Union (AU), the PAP and regional economic communities, mainly the SADC. The department pursued its objectives through four main programmes, namely, Africa Democracy Strengthening (ADS), Balloting and Electoral Services (BES), Enhancing the Capacity of Election Practitioners in the SADC region (ECEP), and the ACE Electoral Knowledge Network (EKN). Major highlights during period under review were the deployment of continental civil society observer missions to South Africa (April 2009), Malawi (May 2009), Mozambique (October 2009) which increased interaction and peer learning amongst African CSOs on election observation and reform. The awarding of the multi-million rand contract to conduct the Transmed Board of Trustees elections provided BES with an opportunity to interrogate methods of conducting large postal and onsite voting. EISA's participation in global and continental events resulted in exposure of its staff members, contributed to improving EISA's expertise and has seen the increase in the number of institutions wanting to work with EISA. It is also worth noting that, following an urgent request by the Acting Clerk of the Pan-African Parliament to provide technical and material assistance, EISA provided on-the-spot assistance to the Parliament during the election of the new Bureau. The unscheduled elections took place in May 2009. The EPP department has generously been supported by the Department of Foreign Affairs and International Trade (DFAIT) Canada, DFID, GTZ Botswana, Ministry of Foreign Affairs, Denmark, Swedish International Development Cooperation Agency (Sida) and SDC. 2008 was exciting and challenging for the Elections and Political Processes (EPP) department. During the period under review, the department was expanded through the incorporation of the Balloting and Electoral Services (BES) department. The EPP department continued deepening its traditional activities in the areas of election observation and assistance to election stakeholders, namely CSOs and Electoral Management Bodies (EMBs) as well as promoting corporate governance within the corporate sector, political parties, tertiary institutions, statutory bodies and CSOs through the conduct of internal elections. The department also continued expanding its continental coverage mainly through organising continental election observer missions and partnering with pan-African organisations such as the African Union (AU) and the Pan-African Parliament (PAP) as well as regional economic communities particularly the Southern Africa Development Community (SADC). The department pursued its objectives through four main programmes, namely, Enhancing the Capacity of Election Practitioners in the SADC region (ECEP), Africa Democracy Strengthening (ADS), the ACE Electoral Knowledge Network (EKN) and Balloting and Electoral Services (BES). A number of milestones were reached in the course of 2008.EISA offered support to the PAP providing technical and financial assistance to PAP's Election Observer Missions (EOMs) to Zimbabwe (March and June 2008), Angola and Swaziland (September 2008), and Ghana (December 2008). EISA also fielded its own election observer mission to Zimbabwe and its first Pan-African CSO election observer missions to Zambia (October 2008) and Ghana (December 2008). The continental missions were essentially made up of representatives of CSOs from the five sub-regions of Africa. This was a departure from previous EISA observer missions which were made up of observers from the SADC region. EISA also successfully conducted a multi-stakeholder post-election review conference in Madagascar which highlighted the urgent need for electoral reform. In the area of corporate governance, BES signed a contract to conduct elections for the South African Government Employee Pension Fund (GEPF), the sixth largest pension fund in the world. The Elections and Political Processes (EPP) Department, consolidated its election work by undertaking its traditional activities, such as election observation and assistance to election stakeholders, such as civil society organisations, electoral management bodies (EMBs) and political parties in the SADC region as well as expanding its continental coverage by supporting the African Union Commission and the Pan-African Parliament with election observation. The department is taking steps to conduct more specialised work, including voters' roll audit and parallel vote tabulation in selected countries. This year the EPP Department supported selected EMBs in the SADC region to enhance their capacity to deliver technically sound democratic elections. Through EPP, EISA has continued as the secretariat to the SADC Electoral Support Network (SADC-ESN), strengthening the network through various activities in the region, while strengthening its collaborative relations with the Electoral Commissions Forum (ECF) of SADC countries. During 2007, the Elections and Political Processes department had two main thrusts. Firstly, it continued with deepening its traditional activities in the areas of election observation and assistance to election stakeholders, namely civil society organisations (CSOs), Electoral Management Bodies (EMBs) and political parties. Secondly, it continued developing activities in expanding its continental coverage mainly but not exclusively in supporting the African Union and Pan-African Parliament in the areas of election observation. The department pursued its objectives through three main programmes, namely Enhancing the Capacity of Election Practitioners in the SADC region (ECEP), Africa Democracy Strengthening (ADS) and the ACE Capacity Development Facility. EISA in partnership with the National Department of Education initiated the "Hands up for Democracy" award, an outcome of an initiative that built on EISA's credible track record of interventions in South Africa's schools. The competition took the format of a national essay writing and fine arts competition open to schools countrywide creating an awareness and knowledge in schools about the importance and impact of electoral processes, good governance, human rights and democratic values in the lives of young South Africans. The award had two categories, namely, a Primary School category for learners from the Intermediate and Senior Phases (up to Grade 7) and a high school category, that is learners from the Senior (grade 8 only) and FET Phases. EISA received close on 2000 entries for this competition with the submissions taking various forms, the bulk being essays, a small number of artworks and even one DVD production. The Awards Event was celebrated with a function held at the Women's Prison Constitution Hill, a very fitting and inspiring venue as those who attended used the opportunity to visit the exhibits and look around the prison. The event was attended by the participants, their parents, school principals, members of the Department of Education and supporting organisations. There was great excitement from the scholars and their parents at the opportunity to meet the Minister of Education Ms Naledi Pandor who gave the keynote address, with all the successful entrants insisting on a photograph with the Minister. The success of the competition was evident in the sense of pride and the seriousness with which participants and their winning schools responded to the presentation of certificates and prizes. 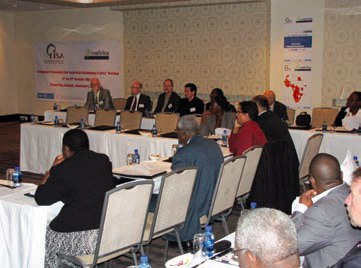 In early 2006 EPP held its strategic planning meeting aimed at deepening its activities in the Southern African Development Community and, in line with EISA's new vision, expanding its activities to the rest of the continent. 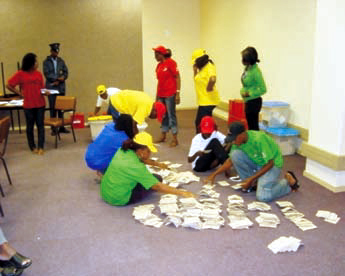 Consequently EPP embarked on the capacity development of its staff in key areas such as election administration training and techniques for voters' roll audits. EPP's efforts were focused on developing good election principles and practices and promoting their entrenchment in the SADC through the Principles for Election Management, Monitoring and Observation in the SADC Region (PEMMO) by raising public awareness and facilitating practical usage of PEMMO; PEMMO was launched in three SADC countries holding elections in 2006, Zambia, the DRC and Madagascar. In December the three year PEMMO promotion programme came to an end and EPP adopted a four year follow up programme "Enhancing the Capacity of Election Practitioners", that expands and continues its previous work. EPP also successfully coordinated EISA's participation in the ACE Knowledge Network, updating key topic areas for this comprehensive electoral resource, attending statutory meetings and completing the Capacity Development Base Project. 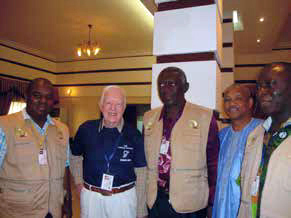 The EPP's strategic objectives for 2005 were three-fold, to promote PEMMO in the SADC region, to build and facilitate the exchange of knowledge among election and stakeholders in the region through deployment of Regional Observer Missions in all elections taking place in the SADC countries and to support election stakeholders, particularly the regional networks such as the SADC-ESN and the ECF. Key areas of activity for the department were: providing technical assistance to all election stakeholders in order for them to play a meaningful role in the electoral process, deployment of election observation as an information collection and sharing mechanism, and broadening the support for PEMMO. The key milestones reached over the period under review include increased awareness about PEMMO, enhanced civil society ability to undertake domestic electoral monitoring and EISA's successful contribution towards the global election knowledge network initiative, ACE Knowledge Support Network. EISA and the SADC Youth Movement co-hosted a Youth Conference in October 2005. Representatives of different youth organisations were present from all SADC countries. The conference's overall objective was to contribute to enhancing youth participation in political parties in the region. The robust exchange of views and ideas among young people contributed to the success of the conference. The conclusion of this conference will inform future regional projects aimed at promoting youth participation in politics across the SADC region. The EPP's objectives in 2004 were the promotion of PEMMO in the SADC region, the co-ordination of EISA's regional election observation mission to five electoral processes taking place in SADC countries, the provision of strategic programming and support to regional election networks, namely the ECF and the civil society-based SADC-ESN, as well as to individual electoral management bodies and countries' civil society electoral networks and support for EISA Field Offices in Angola, DRC and Mozambique, with a view to contributing towards consensus-building and supporting electoral stakeholders for the conduct of successful, credible, and free and fair elections. A number of milestones were reached in the course of 2004. The EISA Field Offices in Angola, DRC and Mozambique became operational and the Principles for Election Management, Monitoring and Observation in the SADC Region (PEMMO), adopted in November 2003, were published in SADC's three official languages, namely English, French and Portuguese. The five elections that took place in the region provided the platform for the practical application of PEMMO as an election assessment tool. The department successfully fielded five EISA regional election observer missions and supported domestic election observer groups in the five countries which held general elections in 2004. EPP was pleased with its contribution to the institutional effort of expanding EISA's geographical coverage. Following the organisation's 2003 strategic decision to streamline its support to election stakeholders in Angola, DRC and Mozambique through a more permanent presence, EISA devised projects for this purpose, in close collaboration with the relevant countries' election stakeholders. 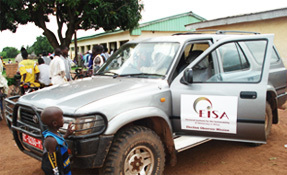 Therefore, EISA Field Offices were opened in the DRC (February 2004), Angola (May 2004) and Mozambique (July 2004). The EISA Field Offices' work programmes varied according to the context. In the DRC the emphasis was on the facilitation of the constitution and law-making processes, while in Mozambique the programme focused on election-related conflict prevention and management training. In Angola, the EISA office strove to help civil society organisations improve programmatic coherence and complementary actions in the area of election, including discussions on the legal framework. This effort took the form of collective planning workshops and the issuing of joint media releases and statements. EISA conducted brainstorming sessions with political parties as well as with relevant ministry officials. EPP implemented a project which focused on countries having elections in 2004 and was aimed at encouraging youth participation in political processes. Workshops were held in South Africa, Malawi and Botswana. While the emphasis differed according to the political context of each country, there were common features: the workshops were used as a platform to promote youth participation in the electoral process; and they were also used to interrogate the policies which affect youth contained in political parties' programmes and manifestos. Through this exercise the project hoped to induce the interest and participation of youth in the electoral process and, in the long run, in broad governance issues. As the project evolved, the department saw the need to include the youth in EISA's broader activities more systematically; hence the involvement of many young people in EISA's regional election observer missions in selected countries in 2004. EISA and the SADC Youth Movement are planning to convene a regional youth conference in the second half of 2005, aimed at designing a road map for youth involvement in election, democracy and governance issues in the region. EISA secured funds for implementing a pilot project on the misuse of state resources during the campaign period. The project is technically supported by the Open Society Justice Initiative, which had implemented a similar programme in Russia and Mongolia. After a scoping study on the available instruments that regulate the use of state resources at continental, regional and country levels, a monitoring exercise was piloted in Mozambique during the campaign. The report of the pilot is being compiled. It is anticipated that after the report is completed, a set of follow-up activities will be devised. The activities of Elections and Political Process started in the last quarter of the year, before which Conflict Management, Democracy and Electoral Education undertook most of its work. The department was tasked with the development and promotion of PEMMO, the co-ordination of EISA's regional election observation, support to regional networks, sopport to the political process in Angola, the DRC and Zimbabwe and technical assistance to EMBs and CSOs. EISA's work pointed to the need for more intensive capacity building in three countries, and a strategic decicion was taken to open offices in Angola, the DRC and Mozambique. Proposals were submitted in this regard and plans made to have them operational in the next year. These EISA Field Offices would help EISA to provide long term contributions towards countries' democratization process. EISA continued to house the SADC-ESN and function as its secretariat in 2003. Under the theme "Building a Sustainable Network", the Annual General Meeting was held in February 2003 and an interim committee was elected to oversee different areas of work. Members of the SADC-ESN took an active part in the drafting of PEMMO and most of them were represented at the SADC regional conference where the Principles for Election Management, Monitoring and Observation in the SADC Region were adopted. Various departments of EISA acted as the secretariat for both the Electoral Commissions Forum of the SADC and the SADC Electoral Support Network, servicing and attending to the administration of both these networks.